It is not uncommon to feel a certain amount of anxiety and hesitation about seeking therapeutic help. 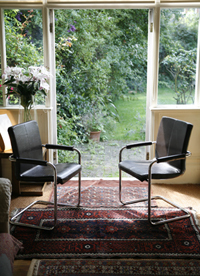 In this respect, it may perhaps be helpful to think about our first meeting more as an opportunity to meet each other, and explore how therapy might help, and whether therapy is right for you at this time. There is no commitment to ongoing therapy at this stage. if you decide that you would like us to continue working together, we would agree on a regular time and day, convenient for both of us to meet. Therapy sessions are once weekly and last for 50 minutes. My consulting room is situated in a quiet street just of Streatham High Road in South London. Parking is available and it is conveniently located for public transport. The fee for our initial consultation, which normally lasts for 90 minutes, is £50. Thereafter, the fee for regular weekly sessions will usually be between £30 and £40 and will be discussed and agreed when we meet. I also keep a number of reduced fee sessions for those on a low income.